I tried to make it as balanced as possible while retaining some interesting possibilities. Would anyone care to comment? Looks pretty decent overall. It might be a bit forest heavy (not counting the top left and bottom right corners) so maybe taking a couple off on each front might help. Also, while I like the idea of the passage through the middle, I think it just feels a bit open and barren with all the roads/shoals right in the middle. That, combined with the fact that the next step back consists of all heavy terrain (cities/forests), it will be very difficult to advance through a defensive line here. In my mind the easiest fix would be to make those 2 islands into 3 islands so that the central battle can take place on normal terrain and the shoal bridges don't hinder advancement as much. Xmo5 wrote: That's also a good tactic in general to ensure multiple fronts are used: Make a shorter (or faster) route with mild-moderate incentive as well as an alternative, longer/slower/heavier route with more substantial incentive (tower, more cities, etc.) The key is to find the right balance to make both viable options for both defending and attacking so that both are used. With that set-up, it might be a good idea to move the airports, possibly to the 2 outside of the 3 islands (if you decide to do that) because they're in a good position to support all 3 fronts. Alternatively you could leave them sort of paired with that one base (wherever you move it to) and give them access to the center and one land front, but not the other. The ports probably won't see much use because they aren't necessary, but they are an interesting addition if someone wanted to save up for a battleship to harass 2 of the 3 fronts. Air units would be the downfall so take that into consideration based on what you're looking for. Now keep in mind that these are basically suggestions/observations. It's your map so you can do what you want to stick to whatever original plan/concept you had in mind, but IMO all of these changes would improve the map in terms of playability. If you make some edits and want more feedback I'm more than willing so feel free to let me know! Oh, and your top left river is the wrong tile! That you have to fix, no excuses. Everdan wrote: 1. Shifted the forward bases back towards the HQ a little, and made them neutral. 2. Made Black Boat more accessible to turn 1 infantry. 3. Edited the central front so that it's less chokey. 4. Changed location of port. 5. Removed a couple forests from the top and bottom fronts. 6. Changed HQ's to labs and made it 2 labs v 2 labs. The way the center is constructed now is going to still make it almost impossible to attack, especially with instant reinforcement from the base and airport available. Shifting the east/west access routes to north/south respectively would be an improvement, I think. I would also not split the islands right down the middle of the map, but rather imbalance the shoal bridges so you can place properties a little closer to the middle of the islands. Having such a big divide between cities (combined with instant reinforcement) pretty much makes it impossible to launch a successful attack. 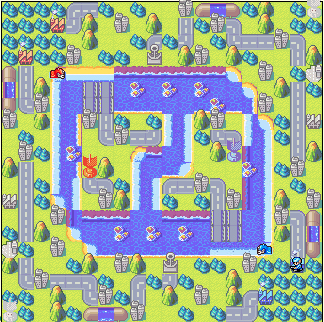 Keep in mind that maps should be designed so that superior positioning will lead to taking an opponent's city - in this case on your map, even if a player takes control of the shoal bridge it will be very difficult to steal a city. One other potential issue is the chokiness of the the top/bottom of the map. It's only 4 spaces wide to begin with, but with the pipes and mountains, it's effectively only 2 places wide in many areas, which will likely lead to stalemates (not enough routes to attack). This is fine for the routes leading to the fronts, but always try to give the fronts a bit more room for attack options. It's always especially neat to have a route just behind the front that allows units to switch fronts quickly (for instance, from the top/bottom fronts into the center). This gives players a lot of strategic and tactical options and helps make games more dynamic. I think the most interesting way to address both of these issues is to lengthen the islands more north/south (so you can connect them to the outer ring), and leave a key access route open for the neutral base player to shift units around. Combine this with lmiting the mountains and heavy terrain in the ring and shifting the shoal bridges in the center, and I think you'll have something really neat. Overall this is a really solid first effort though, good job! Most map-makers aren't ready for relatively high-level commentary like this ever, much less on their first map. But I feel like your map shows you already have a strong grasp of the basics. I've edited the map based on both Xmo and Walker's comments. Great to know that it turned out decent, I had a lot of fun making it. @Walker: If there aren't any more major issues with the map, I think it's essentially ready to see actual play. That said, if anybody else has suggestions, I'm more than willing to listen. Looks excellent, and at this point I would need to see a game on it to be able to give more feedback. Nice work!